Our range of products include bed side screen. We are reckoned as a major entity engaged in developing next-generation Bed Side Screen. 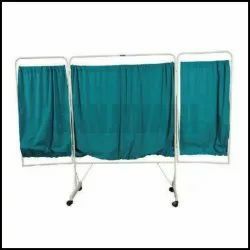 These screens are the most cost-effective way to create partitions in hospital wards and operation theaters. Manufactured under the deep scrutiny of our quality experts, the offered screens are made on a tubular frame of heavy duty material. Further, these easy to fold bedside screens can be ordered from us at a leading price.